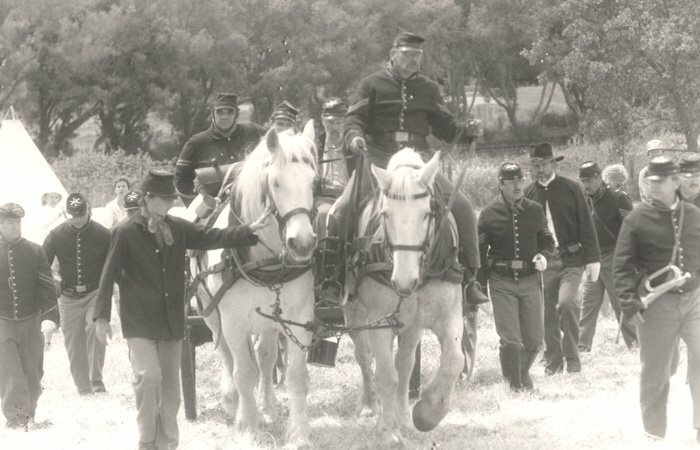 The California Historical Artillery Society is dedicated to preserving and celebrating the life and times of the military horse with emphasis on horse-drawn artillery. 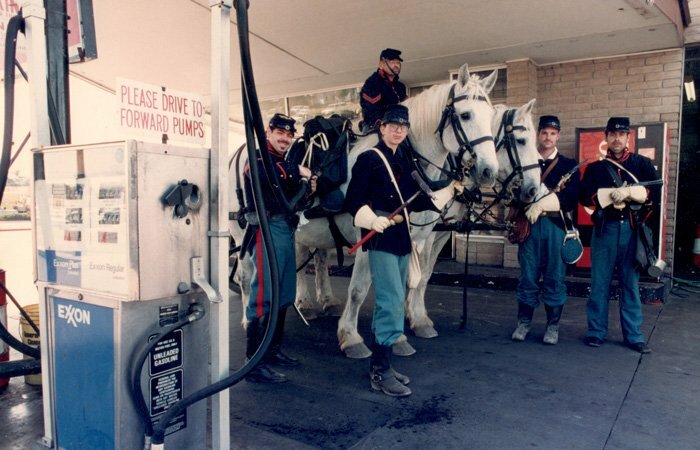 Beginning in the late1980’s with Dennis Winfrey, a history enthusiast and horse lover, the California Historical Artillery Society (CHAS) developed from an artillery unit within the National Civil War Association (NCWA). It all started with two Percherons named Marty and Major. These two gentle giants were trained to take a rider and pull the cannons to placement at reenactments. Dennis knew that to be historically correct, teams of four, six, or more horses were called for to pull the cannons. In addition, a draft type horse was not the 1860’s specification for artillery horses. The modern-day harness racing horse, however, did meet the specs. Dennis rescued his first two Standardbreds, Bud (who unfortunately passed away due to illness) and Burgie. Later, he rescued another six, Grapeshot, Gunsmoke, Gizmo, Buttercup, Bullseye, and Bummer to make the first six-up team. Through Dennis’ support, enthusiasm, and vision, the 3rd U.S. Artillery of the NCWA became the largest private mounted artillery unit in the nation. The California Historical Artillery Society became incorporated as a 501(c)(3) in 1998 when the 3rd U.S. concluded that, with all its horses, rolling stock and members, it could better serve the community as its own entity. Now, with scores of racehorses rescued since the original set, CHAS continues to educate the public with its outstanding and unique historical impression.